On Wednesday, May 27, 2009 I met Dr. Ted Eytan. I was invited to present a patient and caregiver view of hospitalization at a small health 2.0 meeting. I saw Powerpoint presentations with bar charts and graphs. I sat patiently taking notes about the state of ehealth and social media. At around 3:15 I spoke. I described the horror of my husband being diagnosed with cancer and of terror of not being told what was going on. I spoke about the fight we had fought to get to get a copy of the medical record. I recounted the numerous times I had used the information in his record to improve his care. The record sat upon the table in a three inch thick binder. There was silence in the room. We were no longer speaking in the abstract about patients. They asked me to focus on what was the worst thing that had happened through this entire tragedy. I told them the worst thing we experienced was lack of access to my husband’s data. On March 27 my husband, Fred Holliday, was diagnosed with probable Renal Cell Carcinoma. Within one day, I became an e-patient, a caregiver and a medical advocate. I would use the internet for both research and patient/family support. To help my husband receive the best care, I surfed the internet at night; researching his cancer using Google, reading the Wikipedia entry on RCC with all of its links, and finding personal cancer stories. Facebook became the information source on Fred’s medical status. I would take a few minutes each night to post to the 100 plus people following Fred’s care. Within days of diagnosis, two of my friends had set up a Lots of Helping Hands account. This online network, which rapidly grew to 150 volunteers, would fundraise and provide meals, babysitting and groceries. This pool of helpers was immensely diverse. Before sites such as Lots of Helping Hands, orchestration of a volunteer effort this complex would not have been possible. My husband was the model patient: he never complained or caused trouble. We were at the first hospital for four weeks with the only treatment being palliative radiation. My husband walked into that hospital but by week two he could no longer stand and could barely sit. We had no chemo or surgery. I wanted to know what was going on, so on Friday, April 17 I went down to medical records to ask for a copy of his chart. They told me it would be 73 cents a page and a 21 day wait. The next day the oncologist came into the room. It was 9:30 AM on a Saturday. We had a list of questions ready. We had questions like: "When will we have surgery?" The doctor had a different answer. “We have decided to send you home on PCA pump.” I found out later that “we” meant the hospital, the oncologist, and the insurance company, all privy to this decision days before Fred and I were. I had done my internet research. I knew exactly what was going on. This was home hospice. Fred was being sent home to die. The doctor left the room. We cried. Then Fred told me to go after them. We had to suffer and wait that entire weekend, but on Monday I took action. I fired the primary who never visited. I asked my own primary if he would take on Fred. He did and could get him transferred to another hospital. I found an oncology group that said they would see him. I spent three days organizing transfer. Fred’s nurse navigator from his insurance company was so frustrated by how hard it was to complete this transfer that she was crying to me on the phone. I was warned by internist that this was not how things were done. The oncologist stormed angrily into Fred’s room saying, “So you are transferring? Well no one will give you surgery.” He left and I told the head nurse I wanted him barred from the room. We were transferred on Wednesday April 22. We were sent with incomplete and out of date records. Fred was denied care for six hours while the nursing station tried to cobble together a record. Without a current MAR, they came to me to ask what kind of patch is this and when was it placed? Both Fred’s lidocain and fentanyl patches weren’t labeled or dated. Five days before I had asked for the medical record. If only it had been given to me then, Fred would not have been suffering in pain as we tried to recreate a medical record from memory and a fax machine. The next day I was sent back to the first hospital to get the record. In hour and a half they printed out the entire EMR. I gave it to Fred’s new doctors. They looked it then gave it back to me. They said it was safest with me. Fred might go to many facilities but if I kept it his record it would follow him. I spent the next six hours organizing and reading Fred’s record. I found so many mistakes. If I could have read the record on a daily basis his care would have been so much better. Each night on Facebook I posted the tragedy of our life. After receiving advice from Christine Kraft, I began to use Twitter. I did this very scary thing to find one man: e-Patient Dave. He was a well known e-patient and a kidney cancer survivor. Within minutes of my tweet we were in contact. We emailed back and forth that night. Then he called. By 10:00 that evening I was talking to Dave’s physician about my husband’s cancer care. I told him about Fred’s current status and my research and concerns. His quiet calm support helped me to face what was becoming very evident in my mind: it was too late for Fred. His current oncologist was doing everything that could be done in Fred’s advanced state of disease. During all of this confusing and frantic time we were using technology in a different way. We were using it to wrap up the loose ends of a career and a life. When Fred was first admitted he could still stand and walk some. There was a computer room at the end of the hall. If he could walk down that hall Fred could spend a few agonizing minutes surfing the web. He would post to friends and be himself in 12pt font. Soon he could not do that. Fred was a professor of film studies. When he was diagnosed he was still teaching classes. We spent some days getting his class grades compiled. As he was reading one paper, he turned to me and said, “Reggie, try typing a line of this paper onto Google and see what comes up.” I went to the computer room. It was plagiarized. Fred missed the access to the internet and the freedoms it entailed. I got our old laptop refitted for WiFi. Fred was so happy. But within weeks were transferred to rehab and hospice where no WiFi was available. Pain can treated in many ways, with fentanyl, lidocain, and PCA Pumps. But one of the best sources of pain relief for Fred was the internet: access to sites such as Facebook, IMDB and Ain’t it Cool News. So nightly, I would come home and call Fred and log on. I would read him all of his email and post his status. And then we would say goodnight. On April 29th 2009, I sent out an email blast to everyone I knew. I was appalled at the care patients receive: the lack of access to data and the lack of coordination of care. I had worked retail since the early 1990’s. Who has heard of a decent-sized store that doesn’t have a POS system? What business provides service without an itemized receipt? And I have yet find a store that charges the customer for their copy of that receipt. I had been a special education advocate for my son since kindergarten. I had been part of many IEP meetings and had read reams of test results as was my right under the Freedom of Information Act. But in my role as caregiver and patient advocate, I was told by medical records personnel if I wanted a copy of Fred’s medical record I would have to paying 73 cents a page and wait 21 days. How can a patient or care-giver be part of the team if they have no access to that data? In my email blast I spoke of all those families and patients who suffer in silence. I would speak for them. 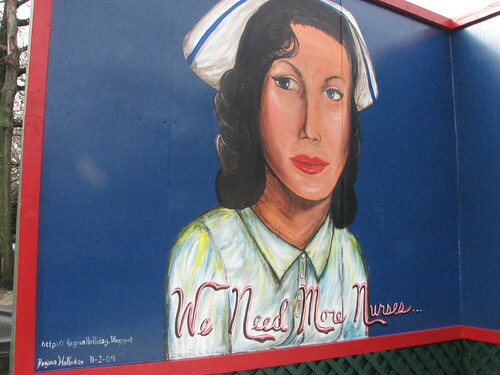 I would paint medical advocacy murals on the walls of Washington, DC. 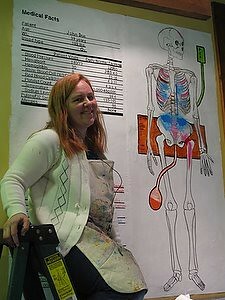 In early June, sitting at Fred’ side, I began drawing the design sketch for the next mural: 73 Cents. This would be a cross between Guernica and Death of Marat with a little Diego Rivera thrown in. This painting would depict our family’s struggle, imprisoned in a hospital where no one is communicating and data is stuck in an internal loop. The figures in this piece would be separated in darkness, and no one would be making eye contact within the frame. On June 17 Fred died. I was his caregiver for his last six days. In home hospice I was in charge of the MAR that I fought so hard to get copies of in the different hospitals Fred had been in. I was the one who gave him his last meds at 7:30 AM. I helped the hospice nurse roll his body to clean him up for funeral transport, and in so doing, held his still warm body one last time. I hadn’t hugged Fred for two months at that point. It had hurt him too much to be hugged. Now I could hold Fred near and cause no pain. On June 21 and June 22 I sent another mass email telling everyone I knew I was going do everything in my power to fix a medical system that keeps patients and families in the dark. I would post on Facebook. I would blog. I would Twitter. On June 23 I began painting 73 Cents. In the next two months the painting would receive worldwide press. It would be the subject of blog posts, tweets and the AOL Splash Page. It would make the cover of the BMJ. The world was talking about patients' rights and data access. This was caused in part by paint and social media. If using social media could get our message out to the world think of what could happen if the medical establishment and empowered patients embraced it. For many years I had the pleasure of working at Barstons Child's Play. During my time at the store I worked as an assistant manager and buyer. I was a full-time employee and individual employee health insurance was covered. When my husband and I looked at the rates to pay for my husband and two children on the policy, we knew we could not afford it. We could barely manage rent, student loans and food on our combined salaries. We paid out of pocket for medical care for many years for both my husband and two sons. When Fred was hired at American University, as part of a large insurance pool we could finally afford FAMILY insurance. Part of my dismay at the way insurance is handled in the US is the fact that small business is asked to shoulder such a heavy burden. There is no way Child's Play -a small mom and pop store, could afford to offer the same low group rate that American University could offer. I made the choice to work at a small specialty store. I really enjoyed working there. I could have probably worked retail for a large corporation and maybe found a affordable family policy. I did not do that. In retrospect, Did my decision kill my husband? I guess it did. But do you want to live in a country where we decide where we work based on what insurance is available to its employees? And in such a country, what would happen to all the Mom and Pop Stores? There is a reason in "73 cents" the small businessman is holding his head at his desk, late at night with a past due notice in front of him. Small business suffers greatly in this country.